there are far better models than apples's iphone available in indian market.there is no need to spend such a huge amount of money on iphone and also without 3G facility in india it's not of much use.so please do not run behind the hype.here are 13 reasons for not buying iphone. 1. 3G iPhone comes in 8GB and 16GB models, and with no expandable memory. 2. Nokia N96 and Samsung Omnia offer higher storage. 6. HTC's Touch Diamond too has high-resolution camera (3.2 megapixel) with an optical auto-focus lens, video calling capability and auto sensor screen pivoting. 7. Samsung's iPhone wannabe Omnia too features a 5 megapixel camera. It supports auto focus, image stabliser, auto-panorama shot, wide dynamic range and face detection options. 9. iPhone lags behind is no MMS and message forward. Users cannot simply forward text messages. Users can only send text messages or snapshots via email. Also, there is no option to send SMS to multiple contacts. 10. while the iPhone offers the popular Google maps, the drawback is that these maps do not offer voice directions in India. The N96 offers Nokia Maps 2.0 with voice directions for India as well. 11. 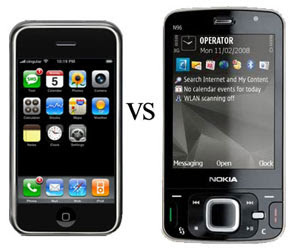 Most iPhone rivals, including Omnia, N96 and BlackBerry Bold can be bought off the shelves with no operator bar. 12. iPhone rivals may be priced at par with iPhone or slightly above, but may actually have lower running costs.